Justice Binta Nyako of the Abuja Division of the Federal High Court did not surprise me with her December 1, 2016 ruling, refusing the bail applications made by the leader of the Indigenous People of Biafra, IPOB, Mazi Nnamdi Kanu alongside three other Biafrans, Benjamin Madubugwu, David Nwawuisi, and Chidiebere Onwudiwe. Justice Nyako was reported to have passed through intense harassment and intimidation from President Muhammadu Buhari not to grant bail to Nnamdi Kanu as he publicly stated in his maiden presidential media chat. It is obvious she has submitted herself to the first stage in the pattern carried out by previous government puppet, Justice John Tsoho, who was disgraced and had to resign from the case after his corrupt practices with the government was exposed by Nnamdi Kanu’s defense team. Nnamdi Kanu was first granted bail by Justice Shaibu of the Abuja Magistrate Court and also by Justice Ademola of the Federal High Court Abuja, but the two separate court orders were flouted by the State Security Service (SSS) and both judges are now facing allegation of corruption, with the former transferred out of Abuja and the latter on suspension. President Buhari has succeeded in trampling on the Nigeria Judiciary and Justice Binta Nyako may have also been harassed into submission. The Nigeria government has repeatedly shown that it has no case against Nnamdi Kanu and other defendants, as the prosecutor has continued to delay the trial with countless amendment of charges against the defendants. 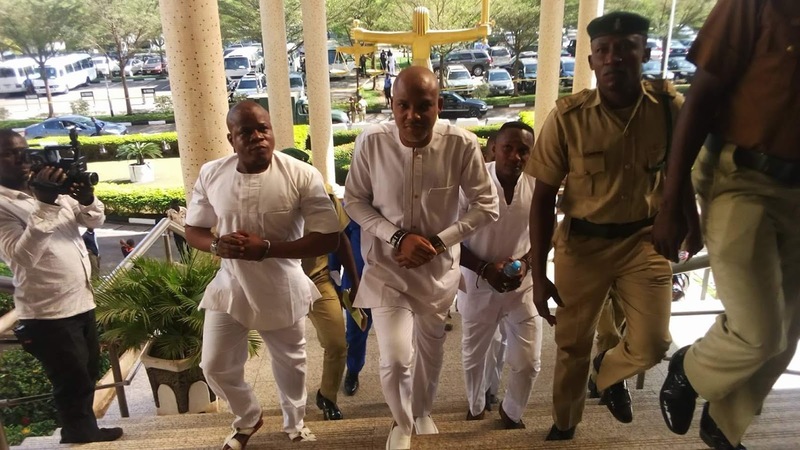 The Nigeria government has amended the case instituted against Nnamdi Kanu and three other defendants with an 11-count charge bordering on treasonable felony and alleged involvement in acts of terrorism. Meanwhile, Amnesty International, Al, has confirmed that the Indigenous People of Biafra led by Nnamdi Kanu have demonstrated peacefully and orderly, and thousands of them have been hacked down to death by the murderous Nigeria military and Police, with hundreds of innocent Biafrans bearing scars and injuries, abducted and locked up in different government detention centers. The international human rights watchdog has strongly condemned the extra-judicial killings against the people of Biafra and has demanded for actions to be taken against the Nigeria military. Nnamdi Kanu is a prisoner of conscience and has only used his voice to speak against the evil been perpetrated against his people, he and everyone associated with him have never engaged in any form of violence in seeking the right of the Indigenous People of Biafra to self-determination, which is guaranteed both by the Nigeria constitution and Article 20 of the Africa Charter on People and Human Right. IPOB is registered in over 80 countries, and has never been found to be illegal or dangerous under any law in the world. The Nigeria government has claimed Nnamdi Kanu was soliciting for weapons to fight the government at the 2015 World Igbo Congress held in Los Angeles but he was speaking unequivocally about defending his people against the Fulani herdsmen terrorists which is currently on rampage across Biafra Land. Justice Binta Nyako absolved President Buhari of interference with the Judiciary even when he had openly directed the defendants should not be released on bail during his presidential media chat. Justice Nyako held that Buhari being a citizen of Nigeria was at liberty to exercise his freedom of speech. Ironically, Nnamdi Kanu was abducted by the SSS under strict directive from Buhari because he exercised his freedom of speech via radio broadcasts. As the trial is set to continue, the government lawyer has applied to the court for a secret trial to enable them employ fictitious witnesses against the defendants. It is hoped that after erroneously denying bail to Nnamdi Kanu, Justice Nyako will not allow masked witnesses against the defendants. They were accused in the open and in all fairness, must be tried in the open.